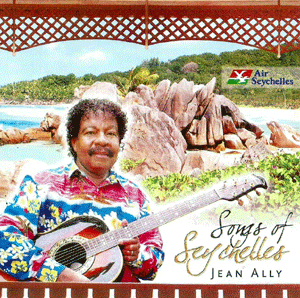 One of Seychelles’ best known veteran artists, Jean Ally, who started singing in 1973 — performing at hotels soon after and represented our islands at tourism fairs abroad – has produced his fifth CD called Sours lanmour. The dozen songs include some new ones, such as ‘What a happy day’, and Ed li, now often played on Paradise FM Radio as well as old favourites including Pardonn mwan manman, Lavi komela and Ma Zozefin. There is also Linite, a patriotic song, often played on national occasions, while Popouri sega is a medley. Jean Ally is also well known as singer of Gospel songs. 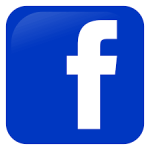 He was born and grew up at Anse Kerlan, Praslin and Aride Island. As he grew up, he adopted the guitar and harmonica as his trademark instruments. 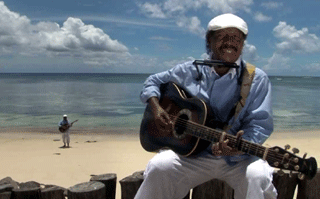 Jean’s talent was quickly noticed and in 1977, he was selected to represent Seychelles at the Nairobi Show, with Patrick Victor and Marie-Cecile Medor, where they became a hit, singing the popular Kenyan song “Malaika”. As the songs rolled on, he got to perform in a growing list of countries including UK, France, Germany, Switzerland, Russia, Japan, Singapore, Australia and closer to home, in Reunion. He also entertained on the German cruise ship Astor for a circuit of the Indian Ocean, calling at Nosy Be, Mombassa, Zanzibar and the Comoros. For the 12-song CD, Jean Ally is backed by such musicians as Peter Jules, Alain Bacco, Cyril Vital, Tony Julie, Andy Constant. He enjoys the vocal backing of Dave Pool and Mina for his song Linite. 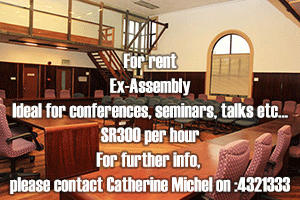 Recording and mixing was done at Seychelles Recording Studio, Mahe, but the CD was produced in Singapore. It is on sale at Ray’s Music Room and Kot Do at R150. It can also be purchased from Jean Ally himself, for R125. 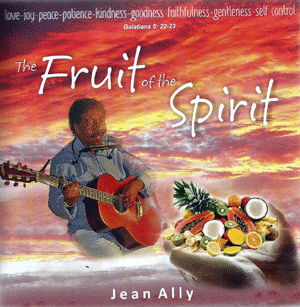 Jean Ally’s new album is the ‘Fruit of the Spirit’ as the title chosen by the veteran Seychellois artist shows. I remember as a child, discovering the talented guitarist and sweet-voiced vocalist through hits like Mon zozo and Ansanm which were brought to our households by the transmitters of ‘Radio Seychelles’, the predecessor of SBC AM Radio. In fact, the now born-again Christian and firm believer in Jesus Christ has since moved to writing beautiful Bible-inspired gospel ballads, soft reggaes, slow segas and even country and western tunes. “When I receive the inspiration I see the fruit of the spirit,” he says. This most divine inspiration is without doubt the source of the new album. ‘The Fruit of the Spirit’, a mixture of English, Creole and French songs where the three languages sometimes beautifully intermingle, was launched recently at the Pentecostal Church, Mont Fleuri. Dressed all in white, the gospel singer was for the occasion accompanied by a live band composed of some of the musicians who have backed him on the album. Himself a fine musician for the last 35 years or so, Jean has chosen among the best folks around for the album recorded in Seychelles but mixed in Germany: Jack Vidot, Trevor Larue, David Andre, Marcel Celestine, Barsley Lafleur, Kersen Vidot, Jean Thomas, Patrick Victor, Kenny Mousbe, Errol Talma and Mervin Nibourette. The songs would not be as sweet and restful without the perfect blend of voices from chorists Jany de Letourdie, Danielle Denis, Daniele Larue, Janet Robert, Alana Payet, Hervé Malow, Alan Ally and Jean’s own daughter Elsia. Through the album, Jean illustrates the need to give your life to God as illustrated by the now popular song En tan pour tou. As he says, “there is a time in life for everything. You can enjoy your life in whatever way you want, but it is never too late, nor never too early to meet Christ”. ‘The Fruit of the Spirit’ is an album you must buy as Jean Ally invites you to “discover the word of the Lord which never goes old and which every day revives our hope, everyday revives our lives.